This is not an in-depth article - its just a page where you get to hear my opinions and thoughts on the wonderful device called the loudspeaker. They are everywhere. From the smallest ones in your mobile phones to those really huge awesome ones at music festivals. There is extensive information available in books and over the web about speakers and how they work. However I am providing a short article about them myself and have ripped apart an old blown speaker to show you the insides in all its glory. Audio is very much an analogue dependent topic. Despite digital working its way into the system and providing many benefits, the output needs to be in an analogue form to be useful. The loudspeaker in its very basic task is to provide a conversion of AC electrical signals into sound waves that we can pick up with ours ears. In most cases, the loudspeaker will beconnected to an amplifier which is required to boost the electrical signals to a power the speaker needs to provide the correct (or often over the top :-) level of sound. Well sound itself is actually very interesting. Sounds waves are energy travelling through solids, liquids or gases. The waves can move because the vibrations are passed from particle to particle. Solids allow sound to travel further gases for the simple fact that solids are more dense - meaning there are more particles in a set area. If you put your ear to a railway line you would hear a train coming much before you would by standing back from the rails. However, I certainly do not suggest you do this! If you play music through your hi-fi, you can "feel" the bass lines. Every time the drums are hit you can feel them by putting your hand on a speaker cabinet which is playing at a reasonable volume. You can also get the buzzing feeling as long bass lines are played. This is because your touch senses can feel things moving at anything to 1000Hz and a fair bit beyond. However, at high frequencies such as 10,000 Hz, things are moving at 10,000 times per second and the only sense that you can pick this frequency up with is your hearing. No matter what volume, you would not feel these high frequencies through your fingers because they cannot sense movement that fast. Laying flat on the floor, facing upwards - in this position, low frequencies are lost entirely and the speaker becomes quiet and limited to a very small range of frequencies. In free air - Thing improve a little... the further away from the floor, the slight increase in low frequencies up to a point. Sound does seem however a bit lost. Mounted on a "baffle board" - The improvement this gives is quite incredible. Just by mounting as loudspeaker on a flat board with a hole in it improves frequency response so long as the board stands at right angles to the floor. Put in a pile of sticky tape rolls (or something similar) - If you stack some rolls of sticky tape from the floor and then place the speaker on top, you will notice a gain in volume, particularly at low frequencies. This is the simple basis of an enclosure. Put an unwanted Compact disk in front of a speaker and see how the sound changes dramatically as the sound is forced through the hole in the middle. Fully enclosed - A proper fully enclosed cabinet is air-tight. With minor holes, sound leaks out and the overall quality is reduced. I find this method to have an extra use too - it stops the speaker from vibrating to much and gives guaranteed added power handling. Reflex ported - However, a well designed reflex ported cabinet will out perform air-tight ones in almost all cases. The port must have a particular diameter and depth to suit the speaker and the cabinet. Well designed systems will have this worked out properly and the result is good sound with deep bass even from only adequate speaker drivers. The explanation of it all is detailed physics, so I won't worry about it :-) Nearly all subwoofers are reflex ported in many different designs. That is the hi-fi side of things anyway. The truth is, a lot of speakers do not relate to hi-fi at all. We have lots of speakers in clock radios, children's toys, intercoms, telephones, public announcements, a majority of radios and ghetto blasters and all sorts of applications as you can imagine. In these cases the only thing that matters is the speaker driver itself. In some cases, the driver chosen has to have specific characteristics. In most cases that characteristic is "cheap". However, in some, the speaker may be designed to be sensitive at a particular frequency - such as an alarm, where the speaker will provide a deafening tone at one frequency, however playing music through that speaker at the same power will sound awful with most frequencies not responding at all. The speaker was quite a big example, 6 inches cone area if I remember correctly. However, it didn't sound very impressive and cost nothing anyway. When its usefulness was lost, I took these pictures of it, labelling each part. I will provide an explanation of each part after each picture as reference. Cone - This is what we all think of when we see a speaker. Its the big round area that cones inward to the centre. We look at how big it is, the material it is made of and even its colour/beauty etc :-) (getting carried away). This is the responsible however for a great deal of the sound created by the speaker system. It is connected to the voice coil directly and is allowed to freely move and vibrate with the voice coil. Gasket - This is a small circle round the outside that is made up of many layers of cardboard. It sits between the chassis and the baffle board that the speaker is mounted to. Rubber Suspension Surround - This sits between the static chassis and the moving cone and allows the cone to move freely whilst keeping it reasonable fixed horizontally so it can vibrate vertically. It also keeps the air pressure behind the cone in a speaker cabinet. Speakers do work without them and there are many instances where they can be ripped or broken and most people can't tell much difference. On cheap speakers, this part is not a rubber, but just thin paper which is fine as low power cheap speakers do not vibrate enough to cause problems. 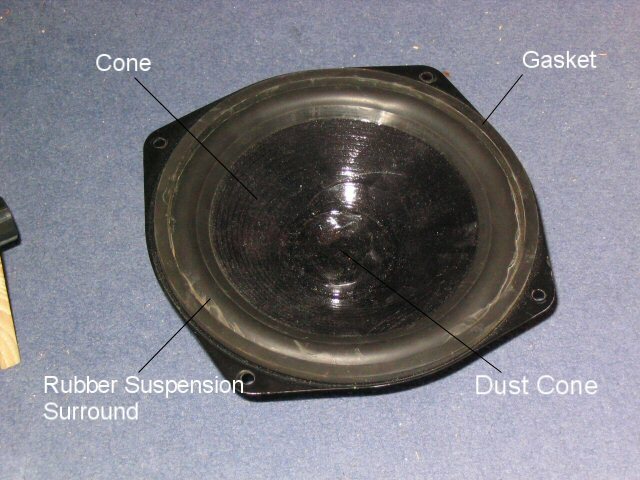 Dust cone - This is a bubble in the middle that covers the voice coil and prevents dust from entering it. 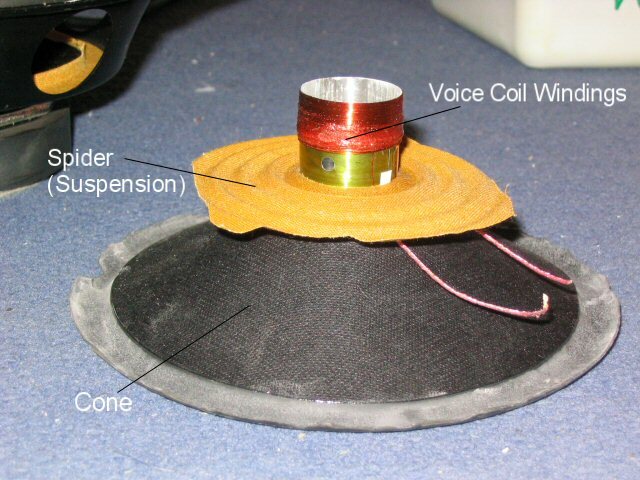 On cheap small speakers, this cone is often a flat piece of paper glued above the voice coil. Housing - Simple really - its the metal enclosure that holds the whole thing together. They are quite strong and most speakers will withstand a person standing on top of their magnet (don't try this to a working one though, just in case). It often provides holes round the gasket for easy screwing to a baffle board. Spider - Name comes from the suspension being a bit like a web. It is the suspension system that does the main job of keeping the voice coil properly in its former. Under non operating conditions - it is tight enough to keep the voice coil in the right vertical position in the former. This is a position that will allow the voice coil to move both forwards and backwards in the magnet. It also prevents any unwanted horizontal movement and a well designed speaker is designed so that the voice coil should never scrape the magnet in most conditions. The spider is usually attached to the chassis housing and the voice coil by strong glue. Magnet - From this side of the speaker - you can see the centre part of the magnet - this one of the poles. In my experience, speakers do not have a set north and south pole standard. Speakers of the same type should repel each other when you try and force them together back to back (South repels South, North repels North). However, some speakers of different types will be attracted meaning that the poles of their magnets are opposite (i.e. North attracts South and vice versa). Between each of the poles is the gap which the voice coil sits in. Voice coil former - This is simply the gap between the two magnet poles in which the voice coil can sit in. The spider keeps the voice coil central in this and allows it to move up and down. This is the place where the magic happens - where electricity and magnetism creates forces of movement. 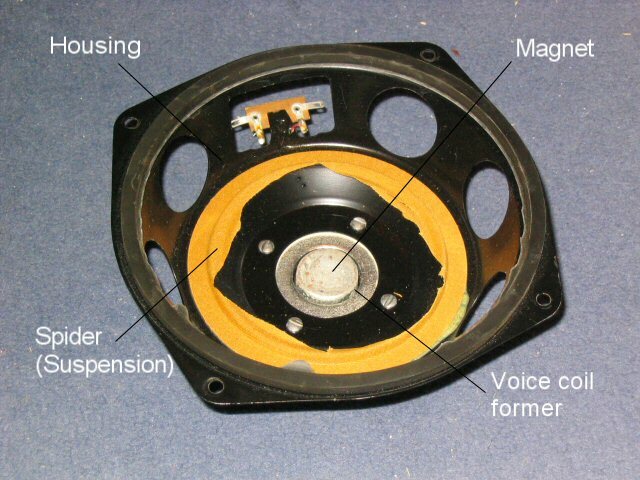 A picture of the removed cone illustrates the cone and the rest of the spider and also shows the voice coil windings. Voice Coil Windings - Usually very thin copper wire wound 100's of times round a solid card or aluminium tube. The windings are normally never allowed to leave the magnet, as ensured by the spider. Better speakers have larger voice coils and more windings to allow them to handle greater power and have better efficiency. Without the wire wound in a coil, a loudspeaker electronically is a short circuit, but it has important differences - otherwise non-protected amplifiers wouldn't mind shorts (they do mind and some will blow their output stages). With the length and diameter of the coiled wire, electrical resistance can be in the region of 4-16 ohms, rather like the speaker impedance (but note these are not the same). From this picture, you can see that the coil is dipped in a non-conductive coating - this simple stops the coil shorting with the wire next to it - other wise it wouldn't act as a proper electrical coil. You can also see the fate of this speaker and how the coil warmed up to a point where this coating was melted. Unlike some speaker blows - the voice coil did not break (sometimes the heat will be great enough to snap the coil) but the coating melts resulted in the coil scrapping the magnet as it moved which meant the speaker did not sound very good and the handling would likely be affected as the energy must go somewhere. From the coil, two thicker wires come from opposite ends and connect to the tag panel. They are flexible and allows the speaker to move. Sometimes, these wires may move up a little through the main cone before turning into actual wires and connecting to the tags. Magnet - this is the opposite pole of the magnet to the centre shown above. Tag panel - Simply where the coil connects to a tag that allows you to solder or push on input wires. 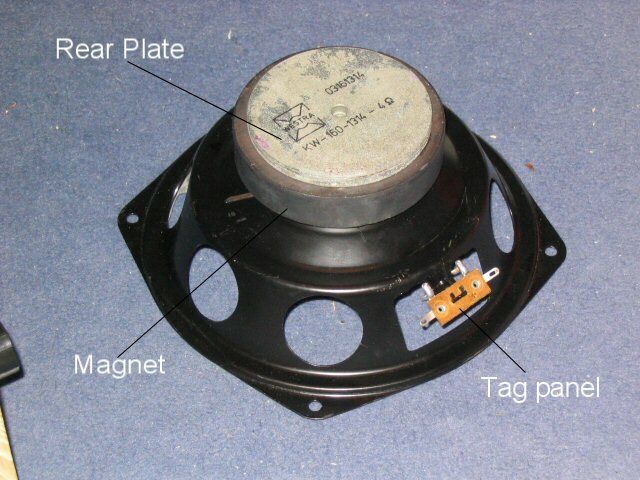 Rear plate - A metal plate that is usually magnetised by the magnet poles - it also contains manufacturer part numbers, and ideally the power handling and impedance of the speaker. But that would be an ideal world wouldn't it, as you can see, this speaker only had the impedance (4 ohms). Well that covers all I want to say really in this article. Its shocking how perhaps the simplest device in audio can effect how your glorious hi-fi sounds. Audio lovers will be able to tell the differences between different brands of speakers and indeed different models from the same brand. I'm not going to say much about tweeters (they are the small speaker in two/three-way systems that produce the high frequencies) as they are often similar in mechanics to normal loudspeakers - however some can be piezo-electric. Just remember to treat your loudspeakers with care - they are a mechanical device which means they will wear out and they also have a certain level where they cannot handle anymore power - listen out for distortion. Experiment with positioning of loudspeaker boxes as there is often an optimum position for speakers and it is different for different models and different rooms and in fact different ears!